"Orchard Road" reached #16 in the UK singles chart during March 1983. Taken from the album Have You Ever Been In Love, the lyrics to the ballad were written by Sayer himself. The previous single "Heart (Stop Beating In Time)" had reached #2 during 1982. The lyrics refer to a very long night-time conversation that Leo once had with his wife from a telephone box, begging here to return. 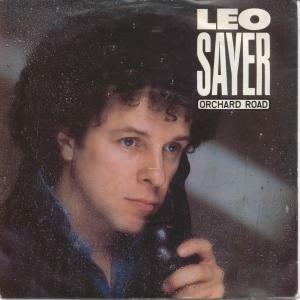 Now, Leo Sayer hardly ever gets a mention when it comes to discussing the subject of 80s music, and is best-remembered for his 70s hits and that big head of hair! However, he achieved success with several hits during the early part of the 1980s. The British singer/songwriter gained a resurgence in popularity after the success of the 2006 remix of "Thunder In My Heart Again", which topped the UK charts. You may also remember when he lost his rag on the reality show Celebrity Big Brother during 2007. 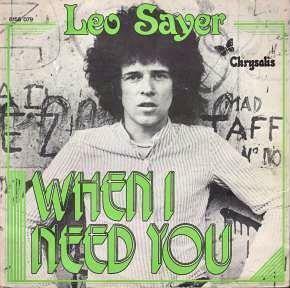 Although Leo had numerous Top Ten hits during the 70's - including his biggest single, "When I Need You", which reached #1 in the UK, US and Canada. My Mum bought it on 7" vinyl in 1977, and I played it rather a lot during my childhood. This was actually Leo's last Top 40 hit single in the UK until 1998, when a dance version of "You Make Me Feel Like Dancing" by Groove Generation reached #32. If you're old enough to remember the seventies, like myself, you will still have memories of Leo's golden days when he had 7 consecutive top ten hits, including "You Make Me Feel Like Dancing" and "Moonlighting", which I used to play quite often on good old vinyl. However, as I've already hinted at, they were actually my Mum's records, and I still have them in a dusty old box which is gathering cobwebs. One day I may just get around to buying another turntable so that I can actually play them again!